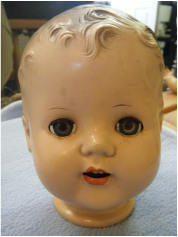 The earliest reference I could find for the Schilling Talking Doll is 1949. 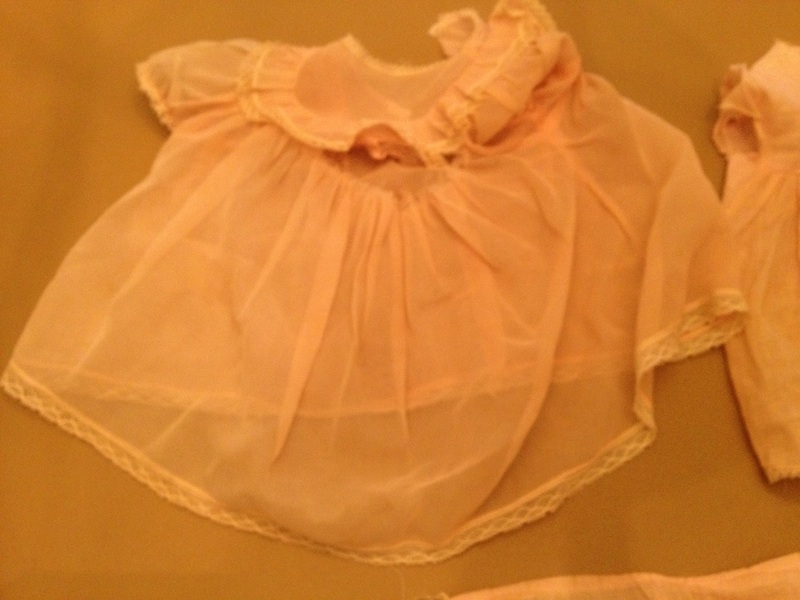 They sold for about $12.95 in department stores. The original hang tag said, "She Talks! Laughs! Cries! Gurgles! Sobs! with a real human Voice. 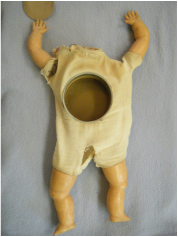 Voiced by J.J. Warner Recording Studios of California" I have seen versions where the phonograph system is mounted in the back of the doll and others where the phonograph system is mounted in the doll's stomach. My sister acquired two of the dolls from eBay. One was in really good shape, whereas the second was pretty torn up and suffering from odor problems - the cloth body and the hard plastic head (that great vomit smell produced by the bacteria working on the plastic). 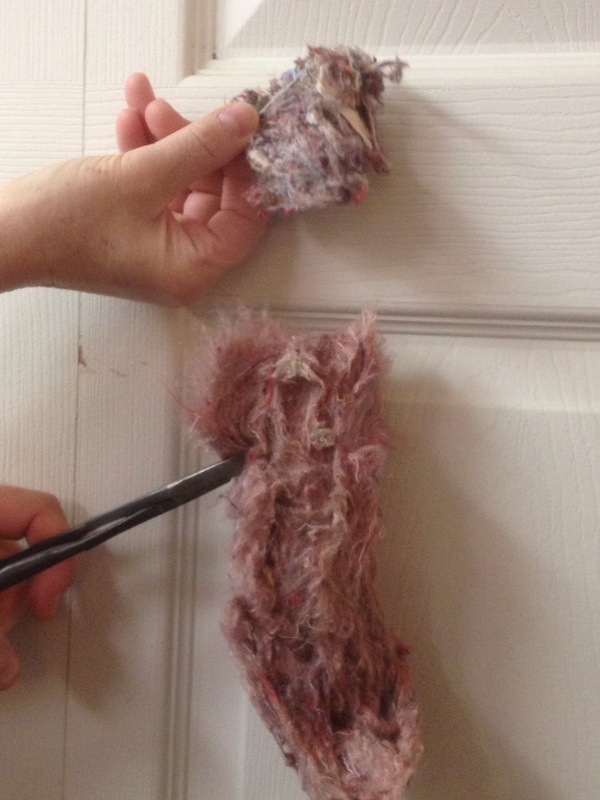 We ended up removing its fibrous stuffing in order to sew up the damaged areas. 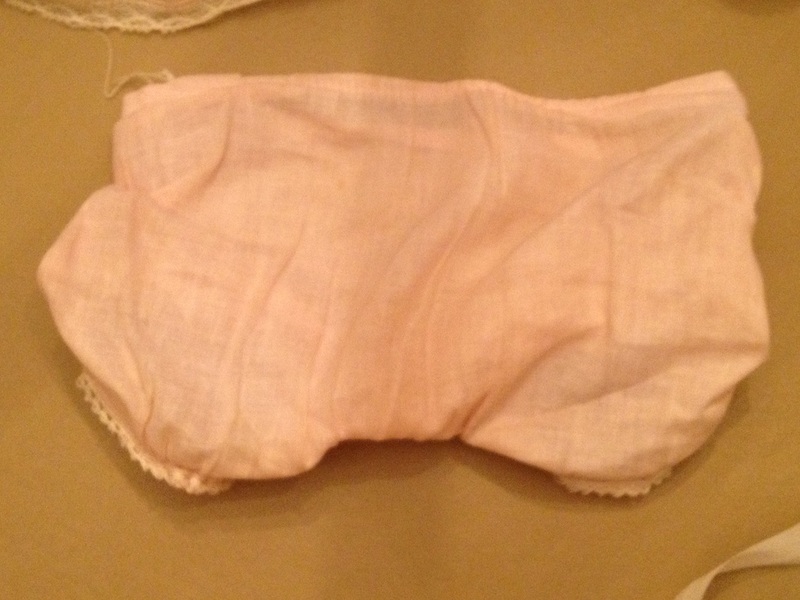 Access to the interior was achieved by carefully untwisting the wire used to bind the cloth body to the flanged head. Neither doll's records would play. I had to remove the clockworks to investigate. The Schilling phonograph mechanisms suffer from two problems. One, the o-rings responsible for spinning the phonograph have turned to dust with age. Second, the records are cut from sheet plastic and warp so badly that they jam the needle/sound box/speaker unit. I decided to try flattening the records by pressing them with a warm iron (covering the record so it wouldn't come into direct contact with the iron). 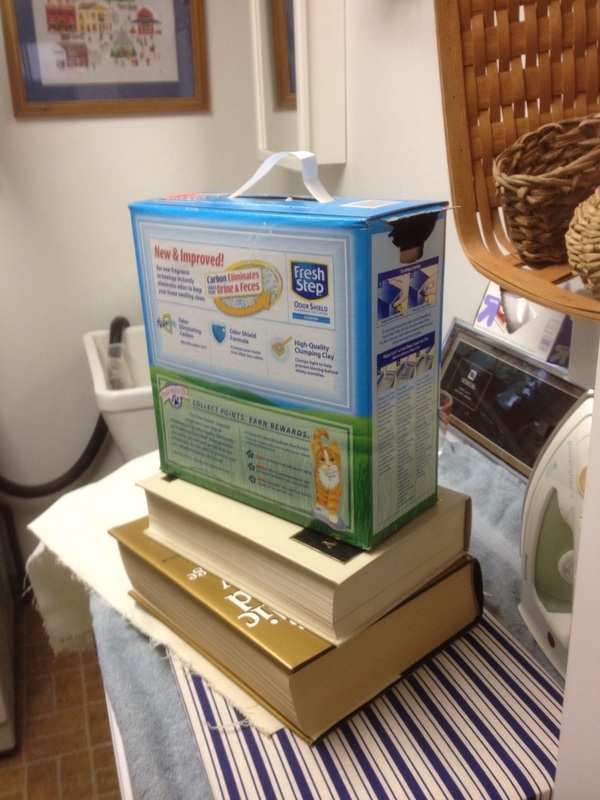 Once a record became pliable, I pressed it under as much weight as was available - several large books and a hefty box of laundry detergent. The record took the new set and all that is needed is to replace the drive belts. I am optimistic that the dolls can be returned to working order. The patents for the phonograph units in these dolls are unusual. The patent number is stamped onto the cover plate of the mechanism and clearly says "1998149". Looking up the patent reveals a sound system that is not driven by a clock spring but rather by a person manually pulling a recording strip past a stylus. The playback depends on pulling the strip at the appropriate rate and at a steady rate. The strip then needs to be reset to its original position before the sound can be played back again. 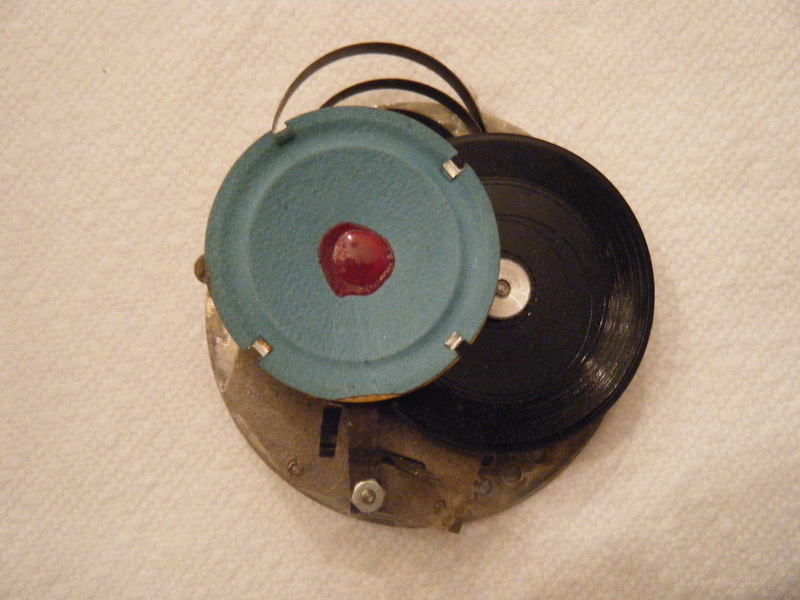 The clockworks in the doll essentially produce the correct speed and steady rate instead of requiring a human hand and the record converts the strip into a loop that can be replayed by resetting the tone arm. 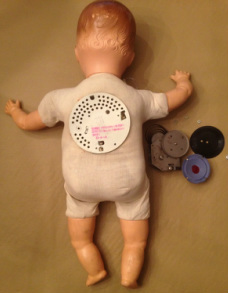 Jesse J. Warner authored a second patent (US2598026A) for a sound pickup and speaker for a phonograph record that is not stamped on the plate but was probably "pending" when the doll went into production. 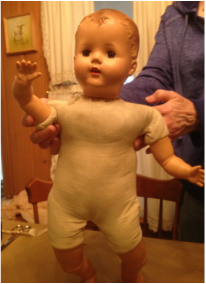 We jokingly nicknamed the Schilling dolls "Big Baby" because they look like the character of that name in Toy Story 3. This doll has a great face. Molded hair does not detract from the life-like appearance. This is likely the original outfit. This view shows the speaker cone and the record. The unwound clock spring is also visible. The fibrous material used to stuff the doll - I have no idea of its composition but it smelled! The neck wire was untwisted in order to separate the hard plastic head from the cloth body. 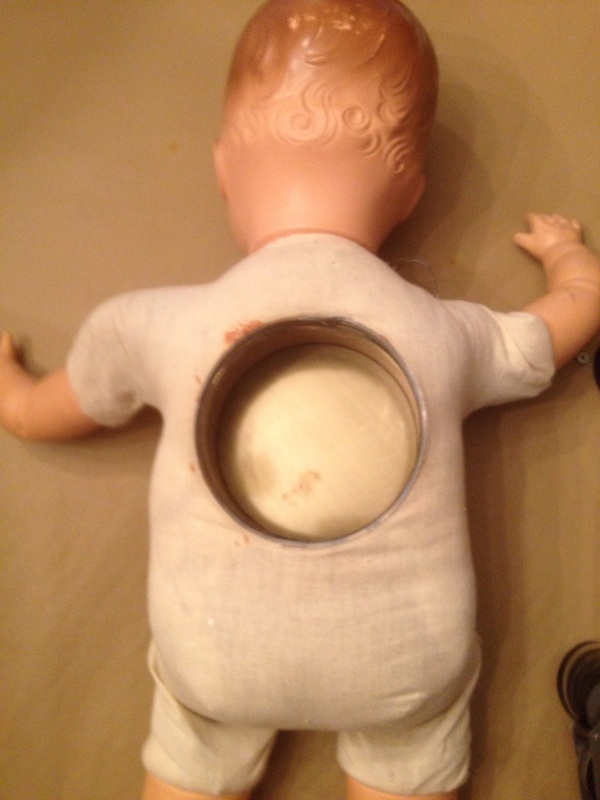 The disks at the top of the photo prevent the stuffing from getting into the doll's head and interfering with the eye closing mechanism. 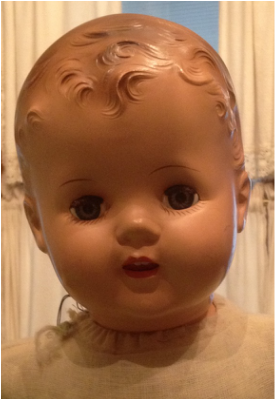 The doll has an open mouth with visible teeth. Notice that the lip coloring was unevenly applied at the factory. 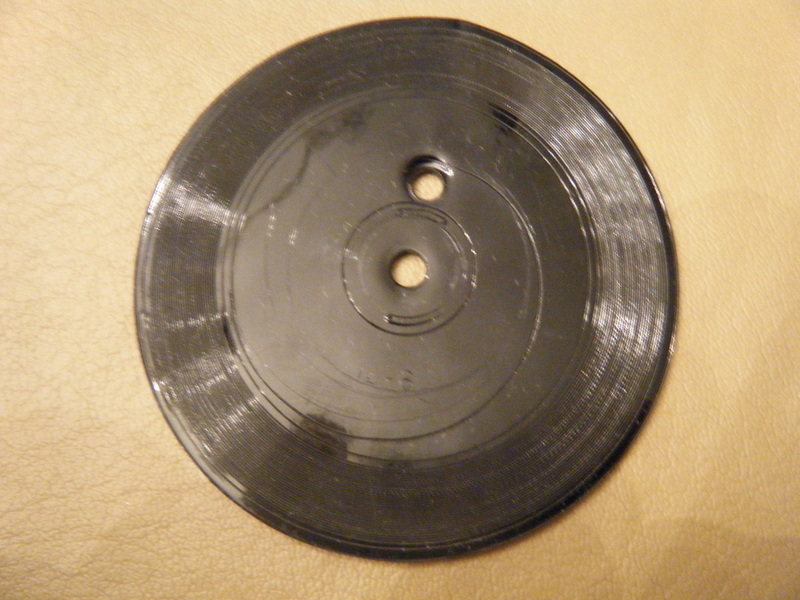 Here is what the record looks like - it is warped from aging. 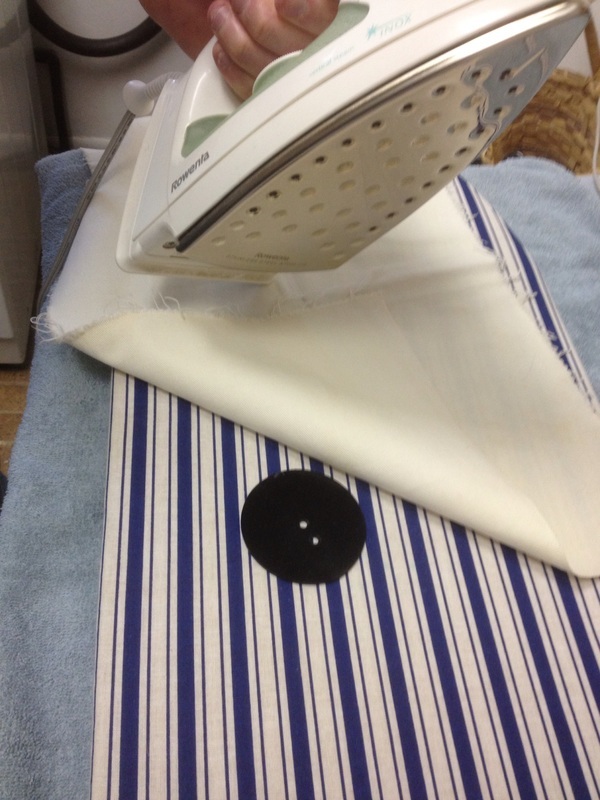 The record was pressed flat with a warm iron (fabric was placed between the record and the iron). Schilling dolls are easy to identify when naked. They have a large circular metal plate on either the back or stomach. 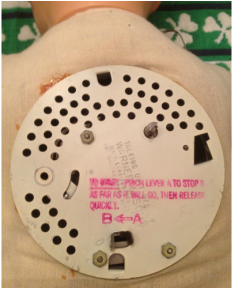 The plate is stamped with the patent information and stenciled with the instructions for operating the mechanism. The tell-tale Schilling mechanism. Unfortunately the key is broken. My father repairs antique clocks and owns a universal set of clock keys. 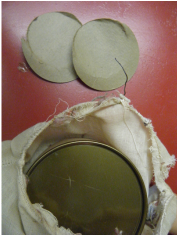 We were able to determine the correct key size and will order an appropriate size key when we finish restoring the doll. A great view of the compact phonograph system. The record is warped! 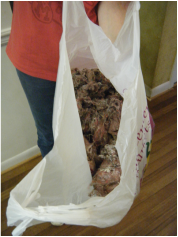 It is amazing how packed in the stuffing was - it filled a plastic shopping bag. The stuffing was removed so that the body could be properly restitched. The fabric is starting to deteriorate with age. 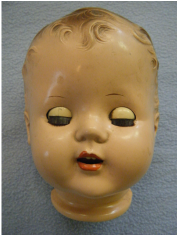 When the doll is oriented vertically the eyes open (see the picture of the head's interior to see the rocker and counterweight system that makes this action possible). 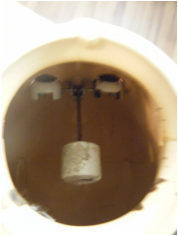 This is an interior view of the head. 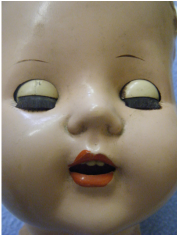 The marshmallow shaped object is a weight that is linked to a rocker for the eyes - making them open and close as the doll is moved from a vertical to horizontal orientation. 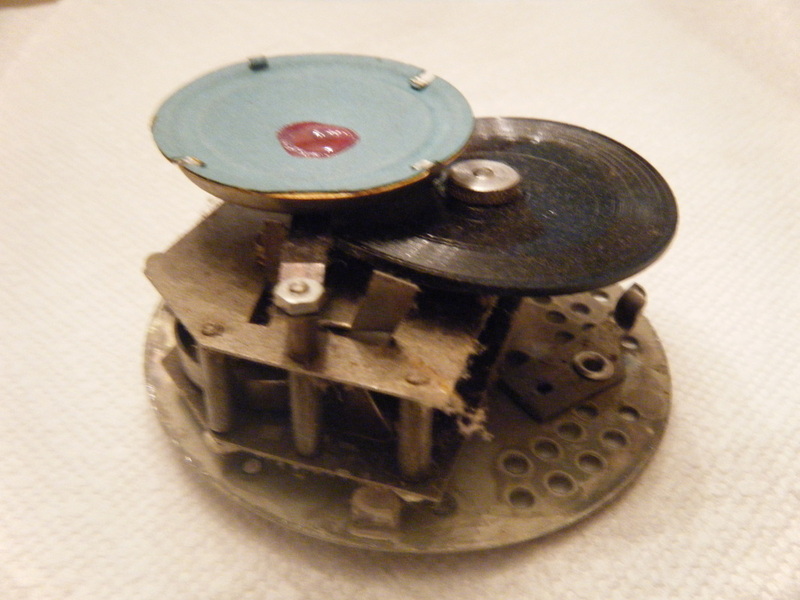 This is a view of the metal canister that the phonograph unit mounts to. Weights were placed on the warm record while it cooled - hopefully to regain a flat set.